MONTREAL, Jan. 29, 2019 - Yorbeau Resources Inc. (TSX: YRB) ("Yorbeau" or the "Company") is pleased to announce that diamond drilling has commenced at its Scott project in the Chibougamau area of Quebec. The Scott project contains a number of zinc-copper-gold-silver massive sulphide and stringer sulphide zones located in northwestern Scott Township. Based on a Preliminary Economic Assessment (PEA) completed in late 2017 by Roscoe Postle Associates (RPA), the project represents an opportunity to develop an operating mine located within close proximity to the towns of Chibougamau and Chapais, a typical northern mining environment, offering the advantages of living facilities and availability of manpower, equipment and materials required to develop and operate the project. The project site has existing access and can be serviced with available hydroelectric power from the provincial grid located nearby. Results of the PEA indicate positive economics with a pre-production capital expenditure of $215 million, a net pre-tax cash flow of $519 million, an Internal Rate of Return ("IRR") of 16.6%, a pre-tax Net Present Value ("NPV") of $146 millionat an 8% discount rate, and a mine life of 15 years. While the PEA contemplates extraction of 12 million tonnes (Mt) at grades of 4.14% Zn, 0.81% Cu, 27 g/t Ag, and 0.24 g/t Au over 15 years of mine life, the RPA report also highlights that exploration potential exist to increase Mineral Resources and, based on the significant amount of drilling already done on the Scott deposit, one of the main areas of potential for increasing resources is west of the regional Gwillim Lake fault, at depth. Recent structural interpretation suggests that the CFO Lens and smaller high grade massive sulphide zones may in fact represent structural "rafts" caught within the fault corridor, and which may have been dragged into the northeast trending fault corridor from an unknown source. If this is the case, interpretation work suggests that the primary source of those rafts may be located at depth, west of the fault, and south of the known Scott mineralized corridor. Company management considers that this target represents tremendous potential upside for the project, and the on-going surface drilling program is designed to test this. 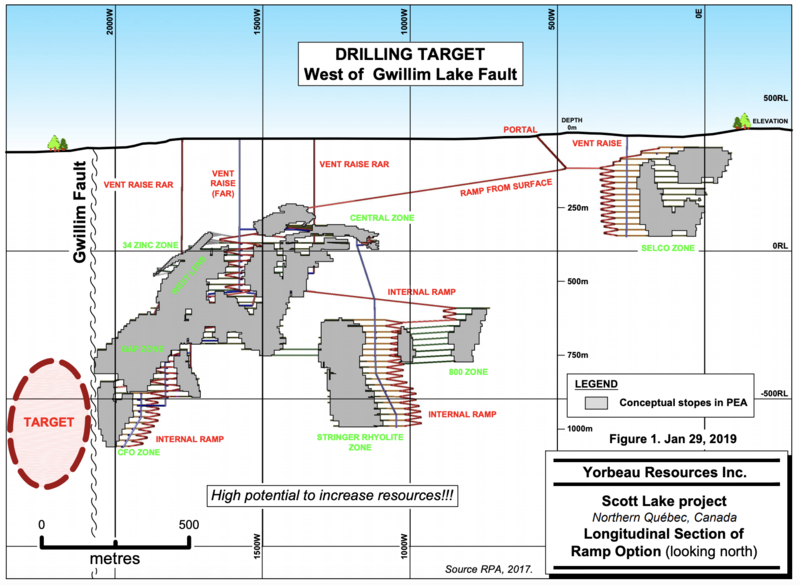 The program is planned in two phases totalling about 5,000 metres of drilling consisting of shallow holes to investigate actual displacement of the Gwillim fault, followed by deep holes and wedge-cuts to explore the Scott horizon down-plunge from the known resources (Figure 1). Gérald Riverin, Company president commented: "We are excited to be drilling again at the Scott project. While the initial Preliminary Economic Evaluation was positive, success in the on-going program could be a real game changer for the project, not only because of the potential added tonnage or grade of the resources, but most importantly because the added tonnage could perhaps justify sinking a production shaft which could help increasing production rate while reducing unit costs. In the meantime, discussions are on-going with potential partners to advance the project." Work at Yorbeau is carried out under the supervision of Gérald Riverin, Ph.D., P. Geo. He is a qualified person (as defined by NI 43-101) and has reviewed and approved the content of this release. Forward-looking statements: Except for statement of historical fact, all statements in this news release, without limitation, regarding cash payments to be made by IAMGOLD and future plans and objectives are forward‑looking statements which involve risks and uncertainties. There can be no assurance that such statements will prove to be accurate; actual results and future events could differ materially from those anticipated in such statements. Yorbeau disclaims any obligation to update such forward-looking statements, other than as required by applicable securities laws.